I really like having metrics about exercise. I have a ForeRunner 305, and it does a fabulous job of giving me lots of information about what I did. 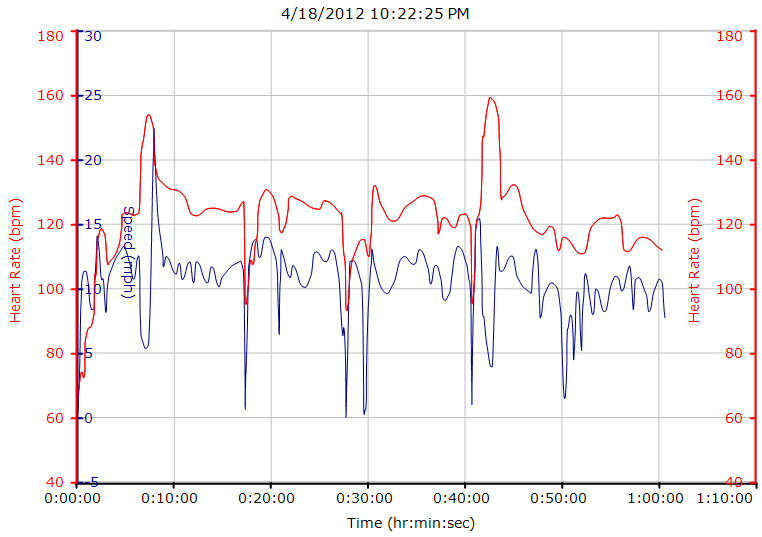 Here's a graph of my ride from tonight. The red line is my heart rate, and the blue one is my speed. There are three places where I stopped for a break. You can see them in the graphs-- they're where my heart rate and speed both plummet. The time scale doesn't show reality for these, since I pause the timer while I'm stopped. There are also a couple of places where I stopped at stop lights or stop signs, and those show up as speed plummeting but heart rate staying about the same. There are two hills (actually, an overpass over a bunch of railroad tracks) on the graph. Can you find them? Also, I was about 15% faster than on my last ride. Also, I'm tracking this stuff on Fitocracy, and I have invitations available.